Dow Chemical Company/ Union Carbide Corp. Indicates projects for which Meccon Industries, Inc. was the "General Contractor/Prime Contractor" per the projects. Project scope of work includes new fuel storage and pumping facility including tanks, fuel piping, electrical power, EFSO, control and instrumentation. Operation building and infrastructure for future expansion. 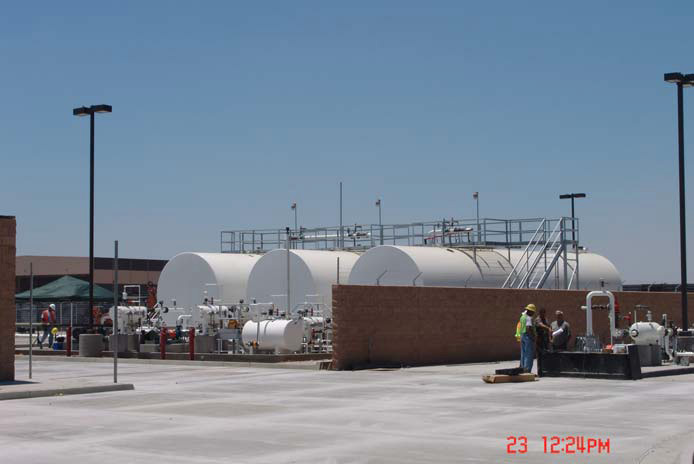 The fuel farm consists of two (2) 9,000 barrel above ground storage tanks, two (2) offloading positions, site work, pavement, containment walls, foam fire protection, building and complete foam suppression system and site utilities. Direct hire of work force for all fuel system piping work. Fuel system testing, flushing and commissioning. Project scheduling, project management & supervision. Meccon is performing this project on a Competitive Bid Lump Sum Contract. Meccon Industries, Inc. is a privately owned industrial company specializing in the installations of industrial facilities where the mechanical/process work is dominant or critical to the project. ©1999-2017 Meccon Industries, Inc. All Rights Reserved. Web Site by Distant Horizon.